Small - $20.99 Medium - $26.99 2X - $40.99 Only 8 left! Jolly old St. Nick seems like a pretty chill and laid back guy. Just look at him, he zips around the world one night a year, and delivers toys to millions of kids, and all he wants in return is some milk and cookies. It seems like Santa has a pretty good thing going for him! But what does he do if he's running behind schedule, and needs something a little more modern to haul his presents around in than a rickety old sleigh and some flying deer? He has his buddy at the Pentagon pull some strings, and calls in some heavy metal reinforcements, because no kids are going to be without toys on Christmas morning if America has anything to say about it! This patriotic Santa on Tank Ugly Christmas Sweater is just what you need to show your support for Santa's newest mode of transportation. 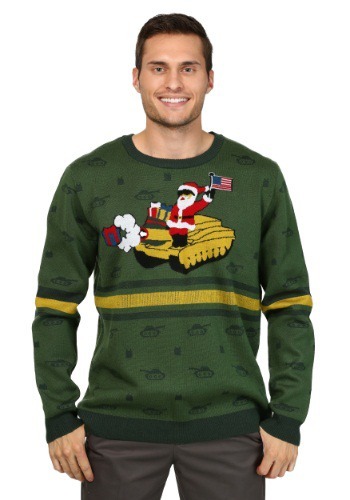 If a sweater with a picture of Colonel Claus and his yuletide artillery doesn't make you want to stand up and salute, then maybe having a gift wrapped surprise delivered to your tree with military precision will get your attention! It might blow a hole through a wall in the process, but you can just ask Santa for a new wall next year.